Writing Suspense – A Lesson from Television. Some months ago I had been glued to my television screen. Like many Danes before me when The Killing was aired in Denmark, I had been eager to find out what would happen next. As expected of any good police drama, there were many plot twists and characters which meant any one of them could be the killer. I enjoyed the series so much I bought the DVD and I’m currently watching it again, mentally making notes as I go along. So what exactly does a television show have to do with writing you may ask? When each episode ends in a cliff hanger, you desperately want to know what is going to happen next, especially when the end is in sight. It’s the same with the novel. Leave the reader in suspense at the end of each chapter, demanding more of their attention. This can also be applied in a book series – make the reader want to buy your next book. 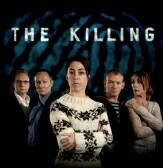 The Killing has so many twists and turns, it leads the viewer in all different directions. By using this tactic in writing, especially crime or suspense, the reader begins to doubt who they originally suspect, which may lead them away from the real culprit altogether. The events in The Killing took place during the first twenty days after the murder of a young woman. The use of time is a technique within novels to heighten suspense, thus hooking the reader in. As a writer, you want to grab the reader’s attention quickly. As events take place, eventually characters begin to doubt those closest to them. Characters’ personalities develop, leading the viewer to take either a liking or dislike to certain ones. It is the same within the novel; create multiple layers to your characters and let your reader empathise with them – even if they are horrible, at least your reader needs to understand why. Know your characters well – they are the driving force for your plot. Next time you watch a drama that hooks you in, try thinking as a writer and apply some of their techniques to your own writing. Previous Post Crime Writing with Peter Doyle. Next Post A Friendly Ghost? Such salient observations Debbie.I went to a CYA conference seminar recently which hightlighted these exact points. Don’t write the tellie off so to speak, just yet. Engaging the audience is what both mediums are all about. Thanks for bringing this home for me again. It would have been good to have gone to that conference – it sounds like I’m on the same wavelength. Great stuff Debbie. I’m always learning from kids movies about witty dialogue and such. I love the horse and his expressions in Tangled. I wouldn’t have the first clue about leading people to the wrong conclusion, that’s clever. Thanks Catherine. I grew up watching a lot of television and film before I became a bookworm, so I suppose it’s natural for me to keep doing so in order to help visualise my stories. Growing up watching Alfred Hitchcock movies, I’ve always enjoyed a good plot twist – as you say, it’s very clever.